Heat the avocado oil in a large pan over medium-high heat. Add in the onions and mushrooms and cook until caramelized, about 7-10 minutes. While the mushrooms and onions are cooking, stir together the water, liquid aminos, maple syrup, lime juice, garlic, ginger, and sriracha in a small bowl. Once the onions and mushrooms are caramelized, add in the tempeh and sauce mixture. Reduce heat to a simmer, and cook, reducing the sauce, until the mixture is sticky, about 7-10 minutes. While the sauce is reducing, add all the sriracha cream sauce ingredients into a high speed blender. Blend on high, scraping down the sides as needed, until the sauce is smooth. 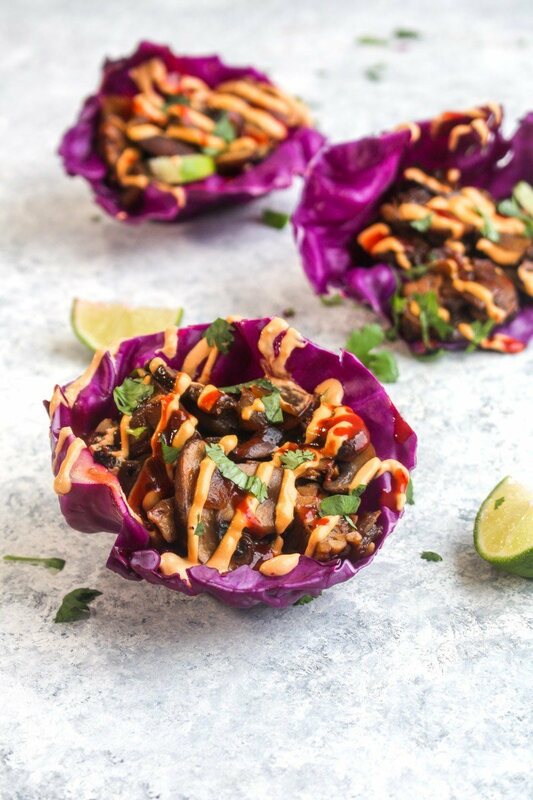 To assemble your Mushroom Tempeh Cabbage Cups spoon the mushroom tempeh mixture into each cup. Top with Sriracha Cream Sauce, cilantro, and extra sriracha. Serve and enjoy.